Money Can’t Buy Happiness, But …. On occasion, money can buy happiness, while there are other problems money can’t fix. Money can’t buy happiness, but it can make your misery more comfortable. Money can keep a roof over your head, it can buy a boat, it can buy a nice home and it can relieve financial stress. It turns out that there are situations when money can buy happiness, and others where money can’t. Save, invest and build wealth is my financial motto. And building wealth goes way beyond money to creating a wealthy and fulfilling life! Find out when money can buy happiness and the situations where all the money in the world won’t create joy. If you think shopping isn’t a way to buy happiness, you might be wrong. If done correctly, shopping or spending money can buy happiness. If so, don’t beat yourself up or feel guilty due to excess consumerism! Research shows that spending, if done correctly, can cause joy, according to Jan Bowen in a recent Psychcentral.com blog post. Buy experiences. You’ve probably heard this one. If you spend on travel you get a three-fer. First you get the joy of planning and anticipating the trip. Then you experience the travel, new places and exciting experiences. Finally, you get to relive the fun in your memory and your pictures. Travel is one way our family splurges. Our recent trip to Jackson Hole Wyoming was so much fun. I got to pretend I was a cow-girl – my secret ambition – go on a wagon train ride and enjoy a cowboy dinner and show! It doesn’t get much better than that! Shopping can make you happy. When I score a designer pair of $90 jeans for $20, I’m happy when I buy them and happy when I wear them. The pleasure continues when I look in my closet and I’ve got something nice to wear, and I know it didn’t break the bank! In this case, money can buy happiness. Money can buy freedom. There’s an entire movement around the idea of financial independence and early retirement (FIRE). AcceleratedFI is a FIRE site that focuses on earning more money with the side hustle. The idea of FIRE, which I think has it’s pros and cons, is that if you have enough money, you have control over your life and your time. Money can help others. Some of the best advice for sadness is to focus on helping someone else. If you take your mind off yourself and give to others, that gives you happiness. I read to elementary school children during the school year. Despite the fact that it takes me away from work, I always come home so happy and fulfilled. The kids hug me, thank me and ask me to come back! And, donating cash, can boost your happiness quotient too. 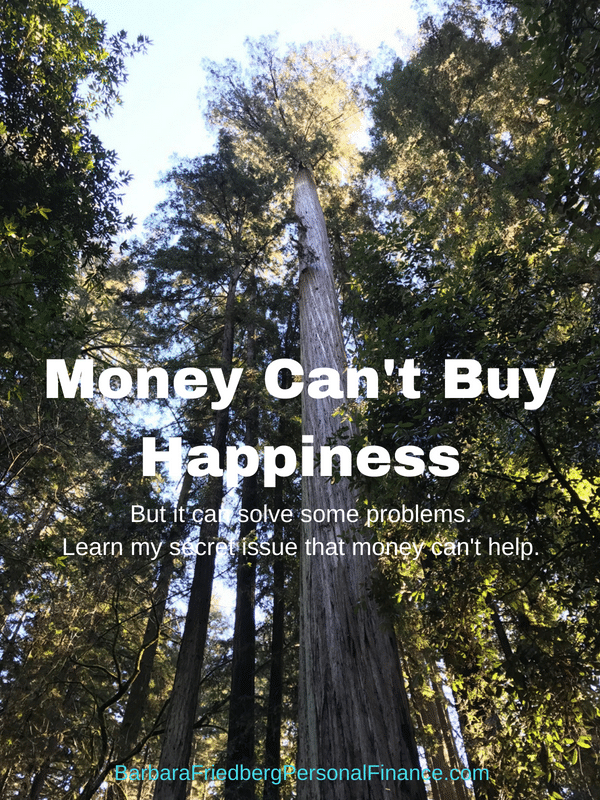 Recently, I’ve been thinking about the reasons why money can’t buy happiness…. a lot. After all, I’ve hit my financial goal and I still have issues, worries, fears, anxiety, stress, envy and more! What gives? Several years ago researchers found that once you hit $75,000 in income, more money doesn’t necessarily equate to greater happiness. “Emotional well-being also rises with income, but there is no further progress beyond an annual income of ~$75,000,” reported researchers Daniel Kahneman and Angus Deaton in 2010. Of course, you should probably increase $75,000 to $85,696.74 to account for inflation (source; calculator.net). This data should also be adjusted for those of us living in the high-rent east and west coastal areas. In San Francisco, a family earning up to $117,400 in San Francisco is considered low-income! So if you want to be happy, having enough income to live well is important. But uber-wealth won’t catapult you into bliss! Money can’t buy good health. Although money can buy top-notch medical care, it can’t buy perfect health or freedom from disease. Look at Steve Jobs, the founder of Apple. At the time of his death at age 56, he was worth $10.2 billion. Money can’t buy sobriety. The media is awash with news of drug and alcohol addicted Hollywood movie stars. From Drew Barrymore, Dennis Quaid, Deryck Whibley, Demi Lovato, and more, there are hoards of substance abusing wealthy. Although money can buy you a trip to rehab, it can’t buy freedom from substance abuse. Money can’t buy freedom from worry. This is my Achilles heel. I’ve been a worrier – forever. I wonder; Am I working hard enough? Did I leave the garage door open? Am I going to get sick? and more. Famous actors worry, will this role be my last? Business owners worry if Amazon will steal their customers. Robo-advisors worry if the field will become too competitive. Money can’t buy perfect families. In fact, money has nothing to do with whether your kids will act out, skip school, do drugs or get in with the ‘wrong’ crowd. In fact, one of the biggest secrets and worries of the super rich is that they won’t be good parents. Money can create problems, too. I know it’s hard to fathom, but having wealth creates worries and fears. The rich have to manage their money or their financial planners. Wealth folks worry about losing it all. The rich can overspend, go into debt and bankruptcy, just like anyone else. The wealthy can get swindled. Remember the Bernie Madoff swindle? In the end, we’re all going to end up in the same place. In the interim, put money in it’s proper place. Recognize that having enough creates a certain contentment. Yet constant striving for more, or to reach a certain number on your net worth spreadsheet likely won’t make you any happier.